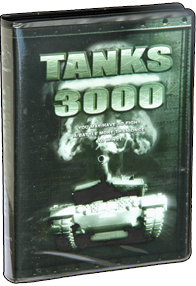 Tanks 3000 is the fourth Protovision game for up to four players. These games have enjoyed increasing popularity at scene parties since they offer a lot of entertainment for players and audience alike. And Tanks 3000 is no exception there! You are welcomed to the game by an atmospheric intro, which is unusual for this kind of game. An option menu follows, with more options than are offered by most C64 games and you can adjust all of these settings at any time. So if you thought you'd seen and experienced everything, you can find a new setting that will make the game feel fresh again. The 4 Player Interface is required when playing with three or four players. 1541 Ultimate, SD2IEC, uIEC/SD, IEC-ATA, 1581, CMD FD. A free demo version of Tanks 3000 is available! Spread the demo as much as you can. After an exclusive start screen the battle begins; the demo version allows two players to battle on one of two arenas with sound effects. Have fun with it! - remotely detonate rockets that are in flight... with devastating results! The game takes almost a whole side of a disk, so enough bits and bytes for many exciting sessions with your friends.